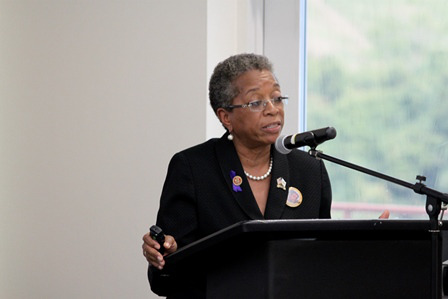 St. Thomas, U.S. Virgin Islands — As the lone Democratic congressional leader from the Virgin Islands, Dr. Donna Christensen has had her share of public frustrations. But like Washington, D.C.’s Delegate Eleanor Holmes Norton, Christensen is a non-voting member of Congress who is forced to establish strategic alliances with congressional members on both sides of the aisle to help her secure federal funding for the Islands, including money for the University of the Virgin Islands (UVI) — a land-grant historically Black college and university founded in 1962. An assistant minority whip in the Democratic Caucus, Christensen chairs the CBC’s Health Braintrust, which oversees and advocates for minority health issues nationally and internationally. She has recently turned her attention to the plight of Black boys, working collaboratively with U.S. Rep. Frederica Wilson, D-Fla. and other CBC members to help curtail the high school and college dropout rate of so many young African-American men across the U.S. and in the Islands. Last week, Christensen spoke to a group of scholars who gathered at UVI in St. Thomas for the second annual international colloquium on Black males in education, sponsored by Wisconsin’s Equity and Inclusion (WEI) Laboratory and headed by Dr. Jerlando F.L. Jackson, the Vilas distinguished professor of higher education at the University of Wisconsin-Madison. WEI is largely focused on highlighting successful program outcomes that offer solutions aimed at solving the series of problems that confront Black males in education. Christensen’s entry into politics was anything but traditional. A graduate of George Washington University’s Medical School, she completed her residency at Howard University’s medical center and began her medical career in the Virgin Islands in 1975 as an emergency room physician. She later became medical director at St. Croix Hospital. In 1993, she was appointed commissioner of health for the Virgin Islands and three years later, was elected to the House of Representatives. Even though the Virgin Islands has long been a destination spot for tourists, the day-to-day challenges facing its residents — particularly young Black men — are daunting. “Thirty percent of all children live in poverty,” said Christensen, who pointed out that in 2010, nearly 62 percent of Black male 11th-graders on the Islands scored below the expected proficiency level on the reading exam. Despite the lack of government funding to respond to these issues, Christensen said that she’s encouraged by the work that is being done to address the plight of Black males.